Playalong for iPad is here! Supernifty is pleased to announce that Playalong for iPad is now available on the app store! 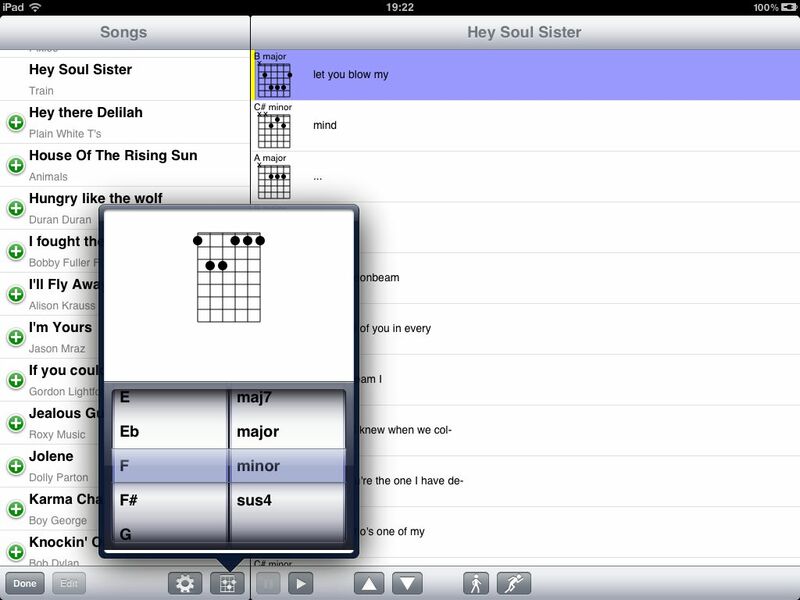 Playalong helps you learn new songs on your guitar, ukulele or banjo with chords, lyrics, a beat and strumming sounds. Each song’s timing matches that of the original song. It’s the easiest way to learn a new song, or play along to an old favourite. There’s over 50 songs to choose from, with new songs regularly being added. Wanna learn more? Check it out on the app store. Don’t have an iPad or iPhone? Have a look at Playalong Online. It’s pretty fun, too. 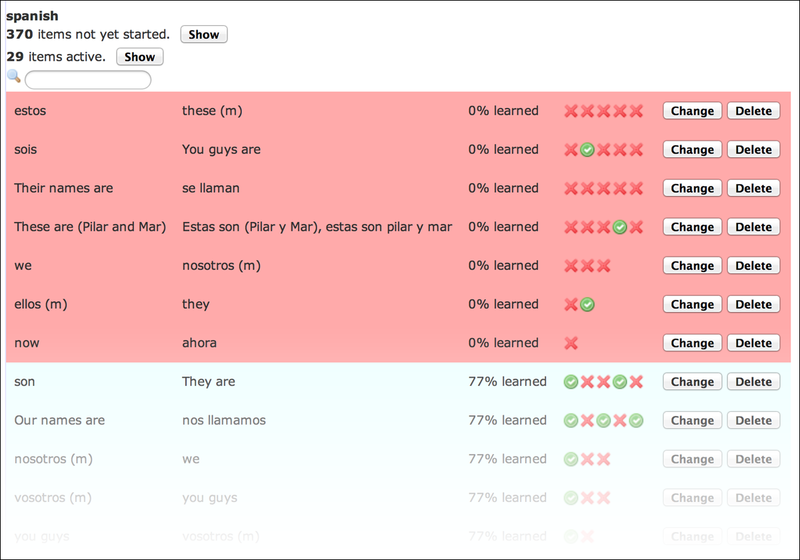 Supernifty is pleased to announce MemShot, a free, simple, web-based memorization system based on spaced repetition. Memory masters like Dominic O’Brien use spaced repetition to memorize incredible amounts of information efficiently – now you can too. Create your own set of flashcards, then MemShot tracks your progress and ensures that you work only on items that most need practice – much more efficient than traditional learning systems. To get started, go to MemShot and start adding facts. Then click “Practice” to start learning. Progress Reports! MemShot keeps track of your progress so you can see how well you are learning – are you progressing well or do you need to up the ante? Trouble Spots! MemShot keeps detailed records of your progress on every fact and you can easily see which items are causing you the most trouble. Reminders! 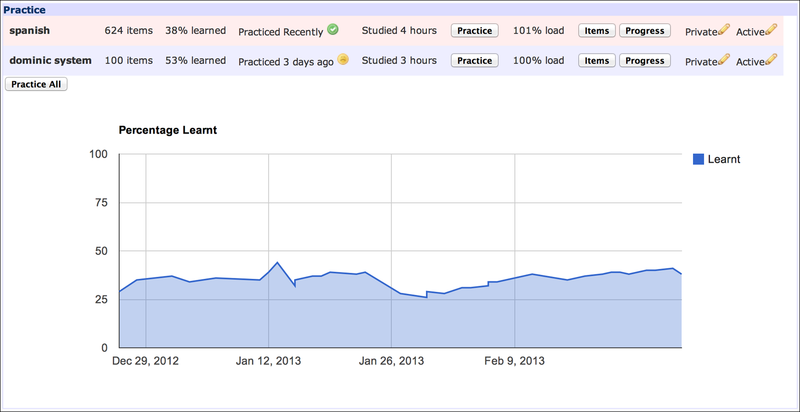 MemShot can keep your motivation ticking over by reminding you when it is time to practice. Sharing! Although experts suggest that creating your own sets helps with the learning process, you can also share learning sets. If you create a set that may interest others, click the “share” button. With just a few minutes each day with MemShot, you can look forward to memorizing an impressive amount of information. Did you know – Jeopardy winner Roger Craig used Spaced Repetition as part of his training? Feedback is welcome. We have many ideas for improving MemShot. If you have one, let us know. Python for Data Analysis is primarily a reference for Pandas. Pandas is a Data Analysis library for Python. Also covered in less depth are some other components in Python’s data analysis ecosystem. There are chapters on iPython and NumPy. A chapter on plotting and visualization provides a great rundown of matplotlib, along with mention of alternatives like chaco and mayavi. Pandas is then presented in significant depth, with sections on data storage, data transformation, data aggregation and time series analysis. This forms the bulk of the book. This is a well-written book that provides a good summary of Python’s data analysis capabilities, however, it will not teach you how to do data analysis. This book will show you how to use the Pandas library. Programming Computer Vision with Python covers the foundations of computer vision along with numerous interesting and practical examples. Python forms an integral part of this book and is used throughout the book. It is an ideal language for this purpose, being easy to understand and with excellent libraries. The scientific library numpy is used extensively. This book is well-written, easy to understand and a lot of fun. There was a heavy emphasis on practicality which I appreciated. Typically the theory would first be explained in text, then implemented in code. Finally a practical example would demonstrate how to apply the theory. There are some great examples. This is where the book shines. For instance, in the chapter on image classification, we are given an image of a Sudoku. The grid location is first determined, then the contents of each cell in the grid are classified into digits. It was great to see some machine learning algorithms applied to real problems. PCA (Principal Component Analysis) is used extensively. SVM (Support Vector Machines) and the Naive Bayes Classifier are also used to solve real computer vision problems. The author clearly knows his stuff, often pointing out pitfalls and demonstrating many handy tricks. A very enjoyable and recommended introduction to the world of computer vision. An oft-cited paper indicates that becoming the world’s greatest [insert dream skill here] is not strongly correlated with talent, lung capacity, IQ or any other innate trait. Their study suggests that by far the most important factor in acquiring a skill is the time spent deliberately practicing the desired skill. “Deliberate practice” simply means “no goofing around”. The authors of the paper studied a bunch of different domains such as music, chess and the scientific endeavour. They found that roughly 10000 hours of deliberate practice is required to become the expert. This is a lot of hours. For instance, at 20 hours a week this will take 10 years. However, the great thing about this is that you are master of your own destiny. If you put your mind to it and put in the effort, the world is your oyster. Pursue your passion! If you are serious about mastering a skill, consider trying the Hourly Time Tracker to see how you are really spending your time. A “mastery” column predicts which activities you are becoming an expert at. You might be a little sad to discover that you are rapidly becoming an expert at “work” or “TV”. Think about the incredible human body that you have been blessed with. Is this truly what you want to spend your life getting good at? ¡Juego de velocidad scrabble en espanol! Supernifty se complace en anunciar que ahora es compatible con la velocidad de Scrabble en español. Si tu eres un nativo hablante de español, o si quiere practicar el idioma español, juega con velocidad Scrabble en españole! Make words in Spanish! ¡Excelente! For some time I have been trying to develop useful daily habits in a quest for self-improvement. A bad way to learn a new skill or form a new habit is to have a short-lived exuberance of enthusiasm before returning to the old you. This has been my usual strategy. This boom-bust cycle is deflating and makes the next effort even harder. Doing a little each day and tracking progress appears to be quite successful at maintaining motivation. Supernifty’s habit-forming tool can help out with this. Set your goals, then click in the appropriate day when you complete a goal. Simple. If you’re like me, or Jerry Seinfeld, then you are well on your way to cementing some valuable habits. The story goes that Jerry Seinfeld needed a way to keep himself motivated when writing, so came up with the “Don’t break the chain” method. Each day he would draw a line on his calendar to indicate that he had done a little comedy writing that day. After a short time, the motivation became to keep the chain going. Soon after, Jerry Seinfeld had created one of the most popular sitcoms of all time. Supernifty’s goal tracking tool shows a “streak” statistic to emulate this idea. Keep the streak going! Be like Jerry! One motivating factor in the habit-forming game is to try to maintain or improve my performance compared to previous weeks. Click on “All weeks” to see how your habit-forming is progressing. It’s also easy to filter on a specific habit. If you’ve had trouble forming new habits in the past, then this goal tracking tool could be the ticket. This same web page includes a tool to track how you spend your time – just hide this if you are only interested in the goal tracker. Feedback is always welcome. If you have ideas or thoughts, or it has helped you out, let us know! Fitness for Geeks attempts to teach fitness principles via “real science, great nutrition and good health”. The book includes sections on nutrition, eating habits, exercise, sleeping and other lifestyle decisions. Many of the principles advocated in this book mirror those of the “paleo” movement, which is based on the diet and exercise patterns of humans from the paleolithic age. The theory is that the human body hasn’t had time to adapt to the modern life. The author begins by describing why the human body is not well suited to the modern life. Sitting around all day eating a diet high in saturated fat is less than optimal. Makes sense. The next section covers nutrition. This section of the book is informative and well written, first covering the “macronutrients” – carbohydrates, protein and fat, before moving onto vitamins and micronutrients. All very interesting and useful. Many useful resources are provided for analyzing what you eat and assessing your diet. Next is a chapter promoting an idea not heard too often – the health benefits of fasting for significant periods. It’s an interesting idea – usual dietary advice is to have a good breakfast; this chapter advocates skipping breakfast. The book progresses to exercise and the author recommends intense, short workouts – he cites the Tabata workout. Also recommended is variety in exercise regimes by using systems like crossfit. The section on resistance training was good, however much of the fitness advice is simply the preference of the author and doesn’t seem to be based on any particular best practice. This book reminded me of “The Four Hour Body“, which was primarily a book of ideas to investigate further, rather than advice provided by an expert in the field. Both books lack the scientific rigour to back up much of the supplied “wisdom”. The connection to “geeks” was tenuous. For example in the section on sleep, there was, inexplicably, a page of source code to connect to the Zeo sleep monitor. A variety of gadgets for health tracking were reviewed in the book. Overall, the sections on nutrition and resistance training were great, sometimes the rest felt a little patchy. “We manage what we measure”… so goes the old saying. Here is a new tool to measure how you spend your time. For months I have felt like I have been too busy to spend time on the things I really care about. A lot of ideas seem to have been permanently “on hold” – my todo lists have seemingly been continually growing, and for months I have been feeling overwhelmed and time poor. I decided to do some real measuring and find out what was consuming my time. This came about after reading an interesting article over at Quantified Self about how shocked and surprised students were after tracking their hourly activities for a week. The idea was to track down where all that time goes and then to decide if these various endeavours were worth that kind of commitment. This would also be an opportunity to compare the reality to how I imagined I was spending my life. Hence, Supernifty’s Hourly Tracker was born. 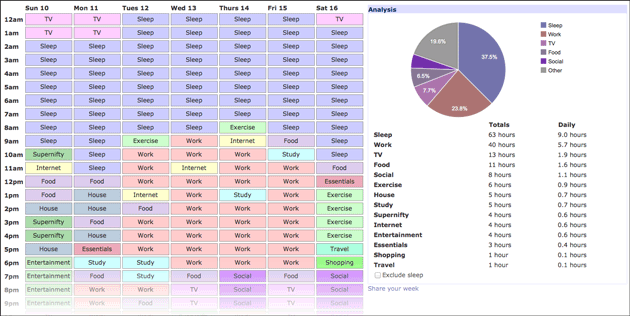 This online tool provides an easy way to track what you do each hour of the day for a week. You can add any activity you want to track. As you can see from the image, you get a decent overview of where the time goes, including some interesting analysis on the right. 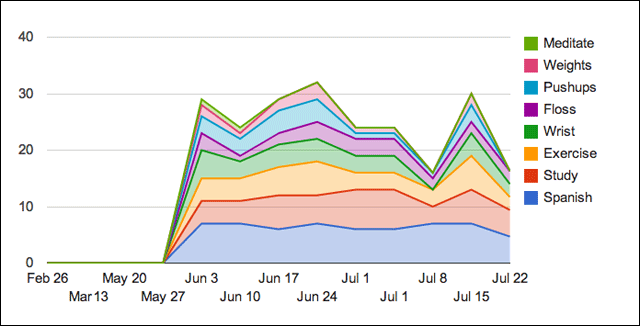 If you track yourself for more than a week, there is Historical Analysis. First of all, it’s clear why many people try to find ways of living with less sleep – for instance the polyphasic movement – sleep takes up a huge chunk of anyone’s life, dwarfing all other activities. It’s also clear why I often feel tired – I don’t get enough sleep. Using this tool enabled me to confirm this suspicion. As with other tracking efforts – such as taking a photo of everything you eat – the act of recording makes you more conscious of how you spend your time. If I start wasting time on the internet I am reminded that I will be recording this. I’ve become much more aware of wasteful activities. Finally, I discovered the cause of my constant feeling of too much to do: mornings. I’d spend mornings catching up on email, reading blogs and researching random items of interest – generally procastinating – before finally getting stuck into work. This would set the scene for a stressful remaining day. By the end of the day, I’d still feel that I needed to get more work done. I’d have a late night and then be tired in the morning, thus repeating the cycle. Using this tool I have learnt that I need to focus on having a productive morning. Try tracking your time, just for a week. I gained significant insights and confirmed things that previously were vague suspicions. 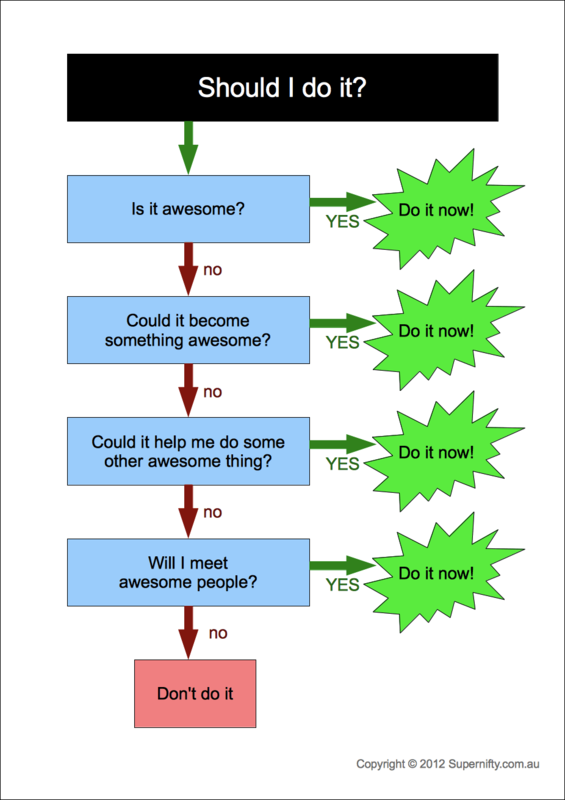 If you’re having trouble deciding whether or not you should do something, Supernifty’s new “Should I do it?” flowchart can help you out with many of life’s conundrums. First, think of something that you are wondering whether or not you should do. For instance, accepting a new job offer. Then, follow the flowchart below. Of course, sometimes making the decision is the easy part – especially now that you have this simple to follow flowchart. Often it’s actually following through on your decision that is the challenge.